Did you miss the opportunity to buy JCPenney's "Too Pretty For Homework" shirt because it was quickly pulled from the market for being outrageously sexist? Thankfully, Forever 21 is giving you another chance to tell your daughter that you think she's bad at math — and that's perfectly fine! As this tee says, girls are "Allergic to Algebra." In other words, they're born with a physical inability to do math. 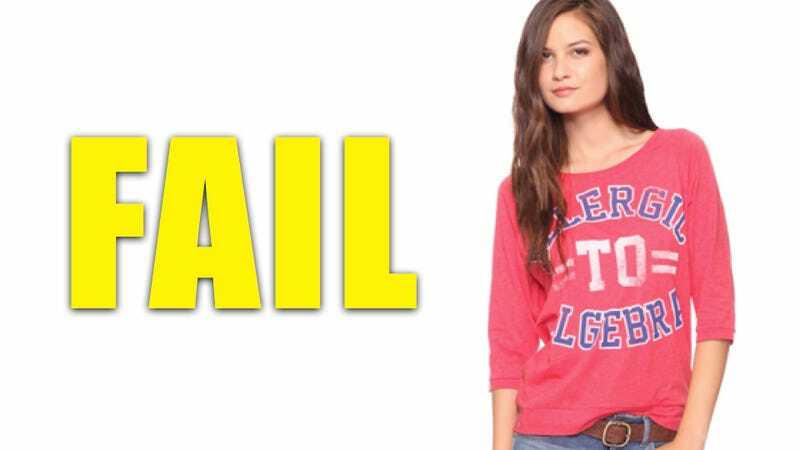 According to retailers, girls long to wear their stupidity on their sleeve. You know, because ladies can't be smart and pretty, and the best way to show boys that you're focused on being hot is to giggle and refuse to apply yourself in class. When a Redditor spotted this shirt in the store, someone had affixed a Post-it that reads, "Smart girls are cool. Don't buy this top." That shouldn't be a problem. There are so many products celebrating girls' lack of basic math skills that we're pretty sure they can't even count. (Why else would retailers be perpetuating such a damaging stereotype?) Since girls can't even figure out if they have $12.80 in their wallet, there's no way they'll be able to buy this shirt — unless of course, if they have their brother or boyfriend count out the money for them.